In 1993 an article was published which coined the phrases “Sage on the Stage” and “Guide on the side”. The core idea in the original text was whether or not learners were seen as active constructors of their learning, and the distinction is now seen as being between a model where a lecturer tells students things which they memorise, and one where students actively construct their own meaning with teachers there to support and scaffold as required. Teachers no longer ‘teach’ – they ‘facilitate’ learning. The belief that children would learn better if only we would get out of their way and let them. The belief that with an explosion of information, it’s more productive to focus on teaching independent learning skills. The belief that technology could do a better job of personalising and opening up the educational experience than teachers can. What’s wrong with this model…? Now… I DON’T intend to disagree with the idea that knowledge is constructed in an individual’s mind through an ACTIVE process of combining what is already known with what is newly encountered. Learners can’t be passive receivers, and everyone’s version of reality will be somewhat unique. One of the supreme triumphs of human evolution is the ability to directly transmit specific information to each other. Letting a child “find out for themselves” does not give them an advantage – being told by someone else does. We need to bring children up to speed on what’s been achieved prior to their arrival on Planet Earth, so they can then spend time improving things. Don’t waste their time making them discover what they could simply be told. Secondly, letting children follow their natural areas of interest will often lead to them learning an awful lot about very little. Fully educated citizens need to understand a broad spread of things they may never develop an interest in, nor ever make direct use of. It helps them to better function within the whole, make better sense of life, be more creative with what they are good at, and generally ‘be prepared’. “…with an explosion of information, it’s more productive to focus on teaching independent learning skills...” This has been the centre of a lot of discussion elsewhere. My own personal take on it is here. Basically – independent learning skills DO offer an advantage… but one which is fundamentally constrained by the quality of knowledge that’s already in our heads. “…technology could do a better job of personalising and opening up the educational experience than teachers can …” The impressive capabilities of computer technology have misdirected us from remembering the true power of having a human adult to guide a human youth. Less obvious though is an argument I’ve made here and here regarding the dubious enterprise of ‘personalisation’ for children in the first place… We can never really know the long term future of an individual child, and we don’t really know the truth of who and what they are as they stand before us – just the symptoms they’re exhibiting at that moment and some possible influencers from their past and present. Teachers are at our most powerful with children when we “keep the pack together” and lead them strongly in the same direction, addressing individual needs that arise as we go. …Most fundamentally though, I think we have also become blind to the subtle programming within the human psyche – particularly in children, but still there throughout adulthood – which means that we are drawn irresistibly towards adult human modelling, to confident authority figures, and to the emotional context which another human gives to any of our experiences. As Bandura’s Social Learning Theory suggests, we learn a tremendous amount through both deliberate and unconscious observation of others, and the power differential that is set-up between a child and the adult who is granted dominion over them can be an intoxicating force for good. The real problem with the original ‘Sage on the Stage’ model of teaching was either that teachers didn’t do enough to ensure that pupils really were actively learning, or that they didn’t really know their stuff well enough to lead learning anyway. Effectively they were just ‘stooges on the stage’. 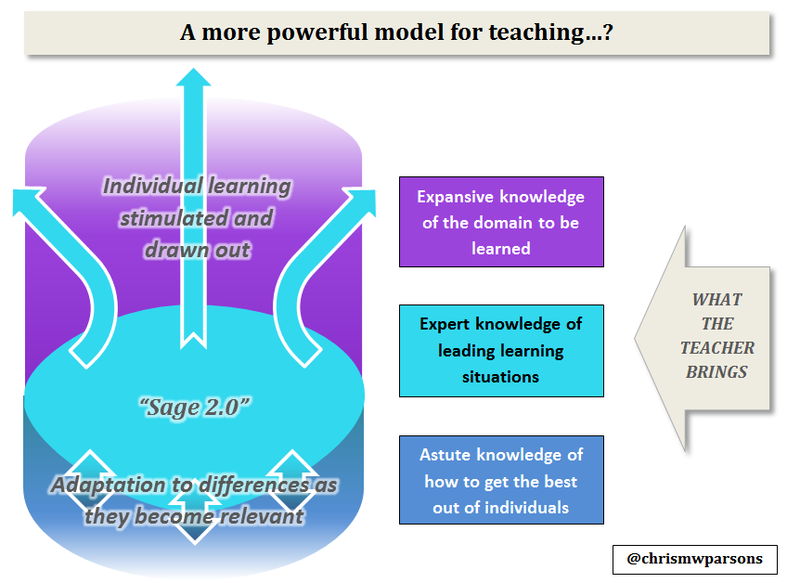 Now, it’s important to point out that this new model still places strong emphasis on teachers being expert in the creation and management of learning scenarios. They still need to know how to lead an active learning environment, and indeed to ensure that all their pupils are learning. 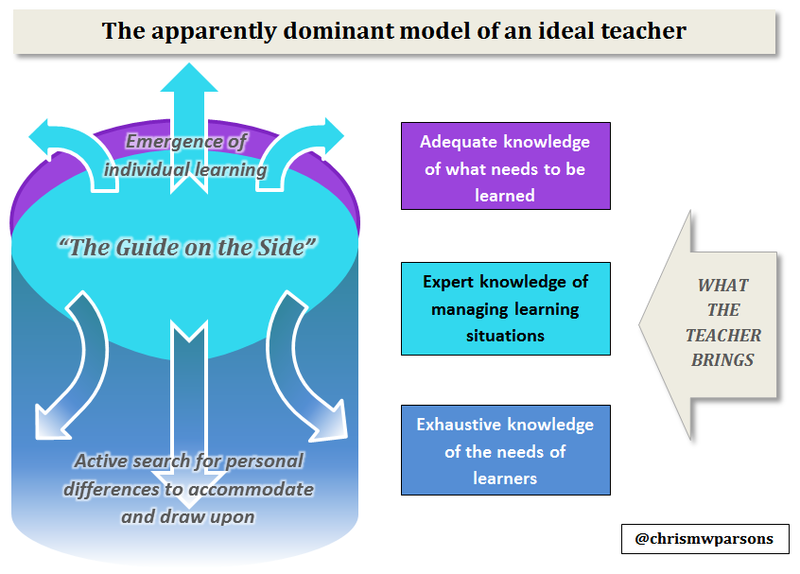 However, in line with what I’ve said earlier – this model reduces the active attempts to personalise learning. The aim is to keep the pack together, adapting to differences when they make a difference, but retaining the same central focus of the group. This allows the teacher to become powerful again in their key position of being a TEACHER, and to put more of their time into becoming expert in what it is they actually want their pupils to learn about. Simply put, pupils need teachers who can offer them wisdom and inspiration – but not simply for how they can become ‘better learners’. This is wisdom and inspiration in the actual areas that it may be most beneficial for them to learn about. 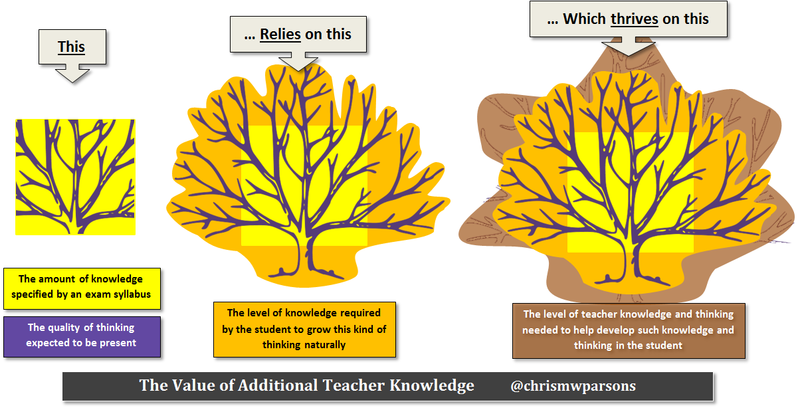 In this sense, there are two reasons for why my new model of the ideal teacher requires a focus on more than just ‘competent’ knowledge. Firstly they lead their pupils’ minds way out beyond their interests, experiences and self-judgements of ‘what’s relevant’. – And I mean ‘lead’ – not just drop them somewhere in the ocean without any idea how they got there. There are all sorts of ways in which ‘going off piste’ – ‘incidental’ knowledge – ‘going off at a tangent’ is actually incredibly useful for helping pupils not only make links between the new stuff and things they already know, but also for staking out the farther reaches of new terrain with intrinsically memorable features. We will all have experienced children who can do this for themselves – making a wacky connection with something beyond the remit of the lesson, or indeed asking a great question which takes the subject matter into new waters. Yes, it’s fine to be able to say to a child – “You know what? – That’s a great question which I don’t know the answer to. Why don’t you go away and research it…?” But it’s even more fruitful if the child comes up with the same question and you’re able to actually answer it, or say that you don’t know, but take it in a parallel direction drawing in other peripheral knowledge. Everybody in the room can benefit from that, and may well be interested in it too if it’s an unlikely way of looking at things. … Possibly the reason why we will have observed them seeming more interested however derives from the second really important function which a richly knowledgeable teacher can do: They channel for their pupils that which is intrinsically ‘vital’ about these strange new territories; not simply what is potentially ‘useful’ about them – but what it is that makes people love and obsess about them. Few teachers wouldn’t say that they want their pupils to be inspired. But inspired by what? … By being connected with what it is that is compelling, intriguing, satisfying and fulfilling in any area of human knowledge and endeavour. In the absence of a pupil being able to properly immerse themselves in every aspect of life, it is the teacher who has the power and opportunity to transmit this subject ‘vitality’ into the hearts and minds of pupils. Now, most subject-specialist teachers are specialists because at some point they found a passion for their subject and wanted to communicate what was great about it. Hopefully then they can ignite the flame of that passion when they are teaching others. This might be more difficult for Primary teachers. It may well be that they chose that age range due to a lucky mixture of feeling invigorated by younger minds and a genuine enjoyment of a mixture of subjects. However, we all have areas to teach sometimes which we don’t genuinely feel a passion for – that’s human life. BUT… even if we ourselves lack a natural passion for subject or topic area, it is perfectly possible for us to ‘get’ why other people DO feel a passion for it – if we just probe around it enough with an empathic, open mind. I believe that the role of expert – or at least additional subject knowledge in teachers has been undervalued in recent decades, with the rise of the idea of teachers as facilitators of personalised learning. I believe that the role of the ‘Sage on the Stage’ can be perfectly compatible with a conception of learning as being an active endeavour, and indeed is the most powerful way that we can accelerate the induction of the young into the world around them. I also believe that if teachers cease to put so much focus on actively seeking out ways to personalise learning, then they would have the opportunity to immerse themselves more fully in the farther reaches of the subject which they are there to open-up for a child, and in the process better stretch learners into genuinely new areas of discovery and understanding. Here here – and can’t think of a more eloquent way of putting it myself. Just to support your point, the EEF report that the impact of technology is based on … wait for it… the skill of the teacher!! Really it is that simple – the better the teacher – the more impact they will have using anything available to them. We do know this – there are teachers with next to nothing getting children in some of the poorest regions of the world to learn to read, write, etc. Getting good basic qualifications is the first step towards becoming a teacher. You must have the equivalent of at least GCSE grade C in English and Mathematics. If you want to teach in primary or in secondary up to the age of 14 you also need the equivalent of at least GCSE grade C in Science. Does the path to become a sage need to start from a different place? Once again, so very balanced like the way Darwin introduces the world to evolution in Origin of the Species- so concious of where criticisms might come and respectfully pulling them apart within his own text (nb. only a couple of chapters into the book, kicking myself for never reading it sooner… but, hey, there’s a hell of allot of time pressure for students and teachers in our schools… I’m finally free to catch up now). On the basic requirements I’d just like to say that I never gave a hoot what grade most of my teachers got in their own school exams. The only time I or my classmates ever wondered this was when the teacher seemed unable to help us learn/get the grades and we had to do it for ourselves… that’s when we say ‘why are they here?’ ‘who let them in?’ I’d happily be taught by any adult who totally failed all their school exams or even didn’t turn up for them, if they went on to develop knowledge that I want, or is at least deemed worthwhile to understand by people I respect, and who is able to help me develop in that direction. I think you’re absolutely right – ultimately the key is the knowledgeable passion for going further with what they’re teaching than for the subject grades they got in a very different time and place. The latter can be a poor proxy for the former. However – taken by themselves, the modest academic grade requirements that Hencloud referenced can give a poor indication to prospective teachers (and society in general) regarding what great teaching should include. …IMHO! In queue for Channel Tunnel at Folkestone at present! Ha, well… if I think it’s true, I don’t see the good in hiding the thought 🙂 I’ve been email chatting the last weeks with a lady doing some brilliant research into leadership (and I’ll hopefully get a piece written on this for my blog soon!) and she said in one of her early emails to me that some of my thoughts ‘resonated’ with Martin Buber’s ideas of I-Thou dialogue. I’d never heard of Buber but am becoming increasingly familiar with his work now, all because of that simple comment. It could be a pretty powerful, fun and quick way to foster learning by just pointing out links between a persons writing style/ideas and that of ‘the greats’? I agree with what you and Hencloud are saying but would take it a step further: Isn’t it hugely distracting to care what prospective teachers or society in general thinks great teaching requires? Of course these requirements don’t help, but it would be an endless task to make everyone believe something about a profession most don’t give a dam about. For example: I don’t care what it takes to be a great surgeon, therapist, TV presenter, dancer, events organizer, administrator, sports coach… all I want is for the people doing these things to care about it takes… and for me to have the option of changing person if I think they’ve not got what it takes to help me. For a prospective teacher all I’d want to see is that they are already teaching something to someone and would probably find ways to teach others their whole life whether they have a position in a school or not. If a person wants to teach nowadays it’s almost inexcusable to not already be teaching; writing on-line, making videos, volunteering locally/virtually etc. Bringing old GCSE grades into this means completely dismissing all the opportunities people have of showing what they can do right now. Right – Back in Blighty! Were you basically saying that you personally only need to know that people in professional positions care about doing what it takes to be a professional in their area (I think there was a slight typo in your post)? Don’t we then rely on some kind of professional qualification to prove that to us…? To demonstrate that these people have cared enough about what it takes to, well, DO what it takes…? In the case of teaching – assuming that we agree that knowing a fuller amount about what you’re responsible for teaching is an advantage we would like all teachers to have – then I guess we could say that – no, it matters little to us how you yourself did at school, but you will have to now prove yourself by embarking on studying, and passing exams in more specific subjects related to what you will be teaching? (this does happen in certain skills areas in teacher training now – more so than previously). I don’t think I’ve got my thoughts together very well here – just back from a long drive! Perhaps we could pull apart what is meant by ‘proving competence’? Are we talking about proving competence before even performing the act/service we are supposed to be competent in, or are we proving competence in the way we develop ourselves once we are doing the act/service? Are we proving competence to a central body that promises to be answerable to the experiences of the people at the receiving end of our acts/services, or are we proving competence directly to the people choosing to invest significant amounts of their time/money/trust in us? The easy way to set up large systems used to be with an official selective entry route, standardized training and a licence from a central body rubber stamping your competence. But, look how this has turned out as people become smarter and demand has increased; the requirements for entry fluctuate, then training options widen with some options being considered a ‘revolving door’, but the central body must still rubber stamp all those who pass training, because that’s the system. As the central body increasingly hears the confused experiences of students going through the system they decrease the freedom of those in the job to develop by requiring them to prove their competence over and over to the central body or face losing their job/not getting pay increases. Thank goodness there are other ways of setting up large systems since the last 20-30 years, I’d be pleased if education caught up. There’s some fascinating stuff embedded within what you’re saying there Leah, and I’m not sure I’m qualified to take it much further! The setting-up of large systems is not an area I’ve ever really pondered that much before, or indeed had much cause to learn about, but it sounds an area with almost unlimited potential for reinvention. As things stand however, I suppose, simply put, I am indeed talking about competence demonstrated prior to selection for training as a teacher – to signify a degree of intellectual/academic potential for the benefit of bodies responsible for training teachers, and also competence shown at the end of the training as a sign to potential employers, whether that means school leadership, parents or indeed students. I think my next large blog might offer things REALLY up your street! Though I might follow this one up with a brief fleshing out of what I see contained in my second graphic above. Absolutely Chris, your original point stands the whole way thought these comments AND we’ve played with an interesting de-tour, very fun! Already looking forward to your next one. The second graphic is great, I like nature analogies. Can’t remember where I wrote this, or if I’ve ever written it: tests are like counting leaves and we desperately need space and time to grow trees whilst understanding that many leaves come in seasons… or everyone gets frustrated! Thanks Leah – I love that quote – I think that’s a better metaphor than anything I’ve written! So we’re back to the idea of unknown unknowns. No child will ever alight on these except by accident – and even if they do, they probably won’t recognise the significance. If we are only taking them as far as known unknowns, that’s not teaching, it’s training. Unknown unknowns are where the real learning lies – and where a good teacher will take children. As for teacher knowledge, I rather like whoever said that ‘Education is what is left when you have forgotten everything you ever learned”. It makes the indirectness of the connection clear, between having gone through the learning process oneself and having become a wise and learned person, which is not at all the same thing. I can’t say I have great confidence in the mean level of learnedness within the teaching profession as currently constituted – the cynic in me suspects that that has something to do with the reputation and pay levels of the profession versus the shortage of people to do the job. YES! That role of taking students beyond where they would ever likely go on their own except through serendipity… I think that’s at the heart of what I’m saying. Thanks IJ.